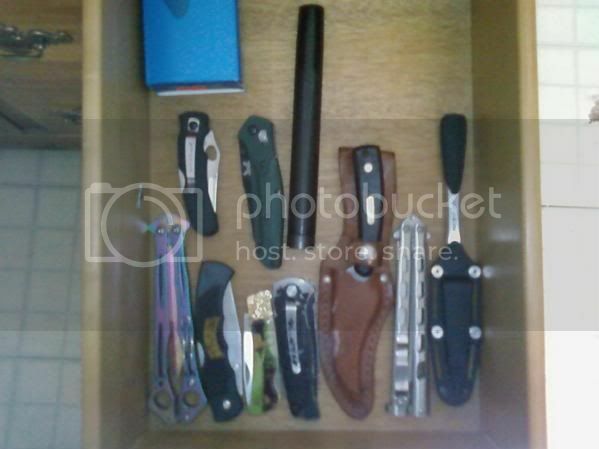 A few in the drawer. My everyday carry knife is a Sog Flash II assisted open. Great knife. I have many many others, but that's my main one. I'll have to get some pics soon. 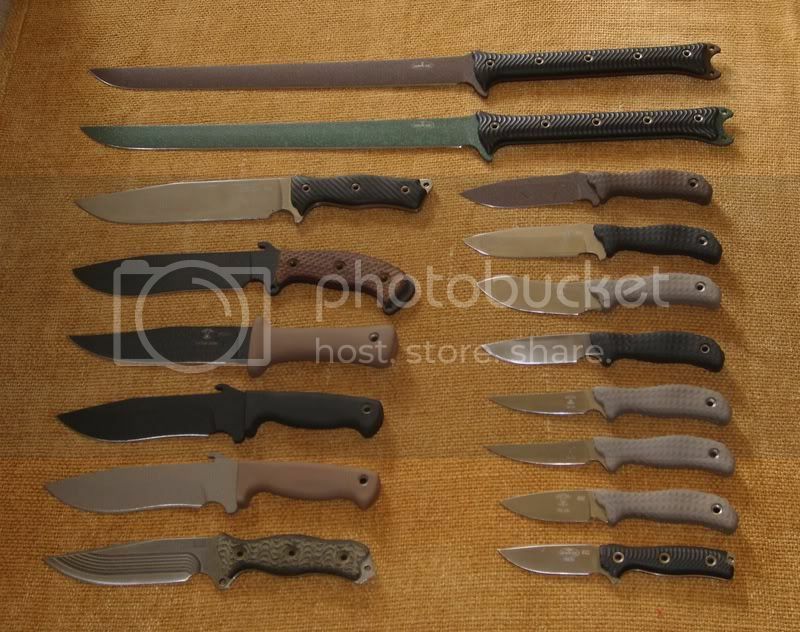 my busse kin blades... sold a few and added a few since this pic but only the duplicate models. Is that a Swamprat version of the Yardhook? 2nd up from bottom left. thanks rover! I've been fighting between the 2 for the last couple years. knives have been winning so far but I slip a firearm in there when I can. SoCal, that's a Busse Bomba Mr. Mojo. I love that blade! SoCal Gunner wrote: Is that a Swamprat version of the Yardhook? 2nd up from bottom left. just reread the question... sorry but that's a tan Yard Hook. Seems to be a rare find. sold my black yard hook but I may have to snag another one later on. SoCal, that's a Busse Combat Mr. Mojo. I love that blade! H&K Auto by benchmade. love this knife i abuse the living hell out of it and it still performs like the day i took it out of the box. Final price combined was a tick over $150. I have been steering clear of SOG, I have a few, but I would rather support a company that makes knives in the States. jmz5 wrote: I have been steering clear of SOG, I have a few, but I would rather support a company that makes knives in the States. Gifted to me by my hg mentor. I have been eying the Chive, but carry one of my Benchmade mini griptillians every day. jmz5 wrote: I have been eying the Chive, but carry one of my Benchmade mini griptillians every day. This is the knife I carry everyday. I use it on the range to hammer in tacks into IPSC posts and pry out staples and cut cardboard. The tip is broken off and the blade's finished is thoroughly scratched. I've always wondered if benchmade would bother replacing the blade. Perhaps not since I use it as a pry-tool. I was real impressed with the Kershaws I picked up blade wise and opening/closing, but I could never quite get used to the smooth grip. They have textured grip versions also. panzermk2 wrote: They have textured grip versions also. I used the blackout for the longest time till I lost it. It is still one of my favorite ones. The blade is very malleable. They will replace it for $35. Is it wrong that even before I break in a bag of new knives I already have a list of knives to get? I mean how many can I carry but...they're so shiny. I just retired my camillus knife after a few months of hard use. I will do a review of it soon. I just replaced it with a sog vulcan fixed blade so far im very happy with the knife.